There's brutality in the world's most divided island which has escalated to unimaginable levels in recent months. The renegade Guy Phillipe and his ragtag army have been busy building an arsenal, with reports streaming in that he has recently received shipping containers full of bullets from his international handlers. According to unconfirmed Haitian reports, Mr. Phillipe has amassed enough weapons to wage a year-long insurgency against the United Nations, though it is likely that he will try to amass far more firepower before deciding to try and seize power from the transition government in Port-Au-Prince. 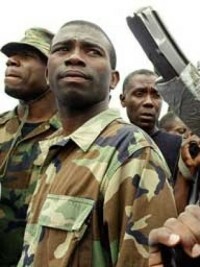 The United Nations stabilization force will still be in Haiti when Mr. Phillipe's men decide to unleash their bullets on foreign soldiers, but it is already apparent to Mr. Phillipe that outside intervention cannot save Haiti, only the Haitians themselves can uplift their nation from its status as a failed state. 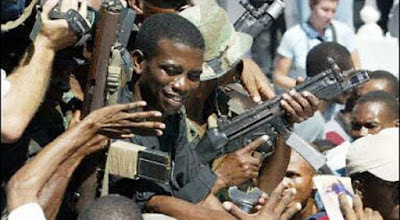 Mr. Phillipe has in the past sought to kill the president of the Dominican Republic, hoping that a heavy-handed response by Dominicans would facilitate his rise to power, as his ragtag army comes to defend the people from the very panic which they initiated. Unable to kill high-ranking Dominicans, Mr. Philippe's men have now taken to attacking Dominican soldiers and immigration officers near the border, with the Santo Domingo government downplaying the events and attributing them to "personal disputes" or claiming that they are "isolated incidents." Nonetheless, Dominican soldiers are being attacked by mobs of up to 15 people who proceed to disarm them and leave them bloody and beaten, often for dead. Eventually the Dominican government won't be able to cover up the attacks, and Mr. Philippe may get the angry, heavy-handed response that he has been seeking.